In recent years there has been a great advance in the methods of producing laminated wood. The strength and rigidity of this most modern material, moulded and machined the Carlton way and RETENTOR sealed gives you a shell that will retain its shape for an indefinite period under varied climate conditions. Extra heavy gauge for strength. The diamond shaped single swage in the centre and the V shaped in-curving of the edges make the Carlton shell rigid. Furthermore, the in-curving provides a smooth, frictionless edge for the head to slide over. 1001 WOOD SHELL 'Retentor' processed - available in any one of the three star finishes to choice. 8 Streamlined, self-aligning, separate-tension fittings and floating head counter hoops, chromium plated. Parallel snares; wire on silk or Carlton VIBRANT all metal as desired. Internal tone control. 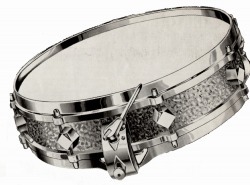 1002 METAL SHELL with V in-curved edges and diamond-shaped centre swage. All chromium plated, can be supplied with 5" shell if preferred. 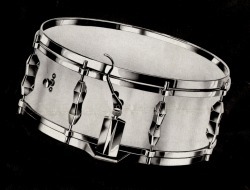 You have a choice of wood or metal shells in snare drums. METAL SHELLS are heavily chromium plated and polished to a mirror finish. Carlton regular hand-burnished cellulose finishes include JET BLACK, CHINA WHITE, SILVER GLITTER. BLACK RHAPSODY - Gold Stars on jet black, WHYTE LADYE - Blue Stars on white, BLUE RHYTHM - White Stars on turquoise blue. 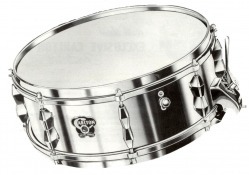 The only snare drum with 3" shell which has PARALLEL ACTION SNARES giving perfect response from every spot. Absolutely every modern development in drumming technique has been incorporated into this superb instrument. The complete absence of obstructions such as any fittings or supports inside the shell ensures clarity of tone combined with a powerful volume of sound never previously available. Available in White, Black, Silver Glitter or Black, Blue or White. 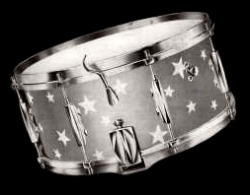 Here is a snare drum that requires no artificial boosting created to give the maximum tonal result determined by modern performance. Introduced by Carlton expressly for the NEW HIT PARADE SOUND, this latest addition to the Carlton Super range with its scientifically proportioned metal shell, parallel action snares, and no internal fittings or supports to interfere with the vibrating air column, gives remarkably crisp responses from sticks or brushes. In fact, you never heard it so good in these times when almost every other instrument is amplified. You'll experience a new sizzling sensitivity when you play a Carlton 20 M.
Drummer designed and unequalled for quality and performance for the player who really wants to 'go to town'. Built for finer drumming. Super cushion rim, die-cast hoops with solid lugs preventing the tension bolts from damaging the heads. Counter-balanced tensioning for smoother, finer tuning without the shell strain. Modern streamlined die-cast brackets. Instant action, parallel throw-off snares. Internal tone control. Why Small Type Bass Drums? The vogue has changed. More Tom-Toms, larger and deeper ones, must now be included in the layout of your outfit. The range of your stick-work is taxed to the utmost. It is now necessary for you to have everything within easy reach to be on the beat, and that's where the new small-type Carlton plays the part. It permits easier access to all your equipment, it is appreciably lighter and less cumbersome, and yet tone and appearance are by no means impaired. Twenty-Twenty, with 8 streamlined separate tension fittings. Two internal tone controls. Metal work chromium plated. Twenty-Four, with 8 streamlined separate tension fittings. Twenty-Six, with 10 streamlined separate tension fittings. 2 tone controls, Counterbalanced Tuning. Gleaming plastic shell finishes. Sparkling chromium plated metal parts. Extra for pearl finishes (White, Blue or Black) or Silver Glitter. Streamlined separate tension fittings. Single angle flanged counter hoops to both heads. Internal tone control. Fitted with 3 legs, each independently adjustable as to height and playing angle. Rubber buffers prevent slipping or creeping. Internal tone control. Two independently tunable heads. Sparkling chromium plated metal parts. Models 1098/9 are extra deep for specially deep and resonant tone and have long pattern counter-balanced tension brackets. Superlative from spurs to cymbals, this is the kit for the drummer who really means to go places. With the ALL STAR outfit showmanship becomes a habit. Complete outfit for the modern professional drummer. New design providing all effects necessary for full orchestra arrangements, individual solo breaks and Latin American numbers. Created for the interpretation of the modern idiom. This entirely new set-up including the Twenty-Twenty Bass Drum follows the latest American Trend. Single ended offset tension brackets for equal stress and strain. Disappearing angled cymbal holder and Spurs. Cranked legs for stability of floor standing tom-tom.